Today’s Guest Poster is zorahzorah, who has written an outstanding analysis of Alberici’s disgraceful performance on Lateline. Hat tips to Gravel and Andrew Elder for bringing this piece to The Pub’s attention. The Pope cartoon – this might help explain it. Fiona!..that pic! !….I wouldn’t even accept a wrapped pack of “lifesavers” from her if she was the tuck-shop lady!……Mrs. Sweeney Todd!! I’ve already been out to feed the animals and clean up their premises and cut 3 lawns! This is the best part of the day! Though, to be fair…nothing could prepare one for such horror..best avouid by choice such locations and certainly not volunteer to go there unless a seasoned correspondent. You got the jump on me there with the lawns, BK…I did feed the nags though…will be going past your part of the world today, taking the horses to Echunga in the big Bedford….will wave! The Fairfax piece on Abbott’s refusal to send medical staff to help with the Ebola crisis was a bit too shallow and too Abbott-friendly. For what its worth, I reckon Abbott, Bishop et al are most affeered of the “sick black person”….being the sort of “cosmetic racists” they are. Good luck with the Beford jaycee! It’s going to be a cracker of a weekend for it. My property is on the west side of the road between the 80 and 50 kph signs as you come in from tour direction. You’ll see a graded area by the road that will soon become a seed production area for indigenous C4 summer grasses. But that was a year ago……. He’s back in Australia again. Kofi Annan says the Ebola crisis was neglected because it began in Africa, and he is absolutely right. The outbreak has been raging since at least the beginning of this year, but no-one cared until victims turned up in Europe and the US. Perth manages to rack up another weather record. The max temp of 35.4°C recorded at Perth Metro is the earliest max temp of 35°C or higher recoded in spring since records commenced in 1897. Some talk at PB re. Abbott’s citizenship. Did he renounce his UK citizenship properly? Letter here from the Dept of PM and Cabinet refusing the FOI request because the letter of renunciation does not exist, or cannot be found. Question is, I guess, whether it has to be on the Australian record, or whether being on the UK record is sufficient. If it exists, that is. No, no, no… this was all discussed last night on 2GB between “we’re no scientists” Andrew Bolt and Steve Price. The BOM is corrupt, and Climate Scientists en masse should apologize for their Global Warming confidence trick before it’s too late and they get sent to jail for fraud. PLEASE, youse: get with the program! The Abbott citizenship thing is a dead issue and if PB is pursuing it then they are a bit late to the discussion. It is possible that Abbott, in his haste to get everything done so he could take up that Rhodes scholarship, may have forgotten to fill in the renunciation paperwork. If so it might have escaped attention until people began to raise questions in around March this year. At that stage someone in Abbott’s office might have fixed up the missing paperwork and given directions to refuse FOI requests that would have exposed the mistake. Abbott’s citizenship is now legal. If it ever was botched we will never know unless a new government allows FOI scrutiny. There are a lot of ‘ifs’ in this and some other questions, the big one being why would the Liberal Party nave failed to check Abbott’s citizenship when he first ran for pariiament or even when there was a possibility he might become LOTO. There had been enough warnings to make sure it was checked.. When Downer was LOTO it was revealed that his wife had never become an Australian citizen and that had to be corrected. Later on there was a big fuss when One Nation senate candidate Heather Hill was not allowed to take up her position because she had dual citizenship. There has also been a court case about Eric Abetz’s citizenship. After all that it’s hard to believe that the Liberal Party did not check Abbott’s status. The whole issue was kicked off by a piece in North Coast Voices early this year, just one of many desperate attempts to find a way to get rid of Abbott. It didn’t work, it isn’t going to work. If – and it’s a huge if – there ever was a problem we can be sure it has now been corrected. Is it really okay for other people to be refused to run or be elected, but it’s okay for abot, just missed doing paperwork? I know it won’t effect him now, but I don’t see why he should be allowed to sneak around and get away with it. On that note, Razz and I are now leaving on our trek to the neuro, see you all for the raffle. In the second round secret ballot, Mr Chowdhury received 169 votes, while Ms Bishop and Indonesia’s Nurhayati Ali Assegaf received 95 and 57 votes respectively. She was considered the favourite. That’s what burqas can do to you. That’s why I don’t think this is a legitimate issue. I think all the paperwork would have been done long ago. If the Liberal Party is so stupid and inept that they allowed Abbott to get to his current position, let alone run for election as an MP in the first place, without checking his citizenship, especially after all the other problems that had come up on the same issue, then they are even dumber than I would ever have imagined. The conspiracy theorists can stick with their ‘He is an illegal’ line if it makes them happy. Very good review of Julia Gillard’s book, from Anne Summers Reports. I’ve almost finished The Book, and this is a fair critique. I’ve often wondered about FPMJG’s awful taste in men, I’m glad I’m not the only one. As for the advice she was given – whoever thought turning her into a Maggie Thatcher clone for the 2010 election campaign, complete with power suits and pearls, should have been hung, drawn and quartered for treason. In this household there were frequent comments at the time about ‘WTF are they doing to her!’ That mistake gave us the announcement of the return of the ‘real Julia’ during that campaign, another thing that was used to Gillard-bash from then on. I think the problem is the conspiracy people are looking for Abbott “renouncing/” his UK citizenship when he never actually had to so. During the last bout of this some paperwork popped up showing his parents had belatedly applied (successfully) to register him as an Australian born in London. At the time Abbott was getting ready for his run at the Rhodes Scholarship and so would have to be a “colonial” of some type to be eligible.. This being so then Abbott would not have to have done a thing to be A Strayan.. Kids born here of kiwi citizens also have/had options for choosing which citizenship to take up at a later date . Can anyone spot the problem with this photo of the second US ebola case ? I guess we can believe the stories of incompetence . 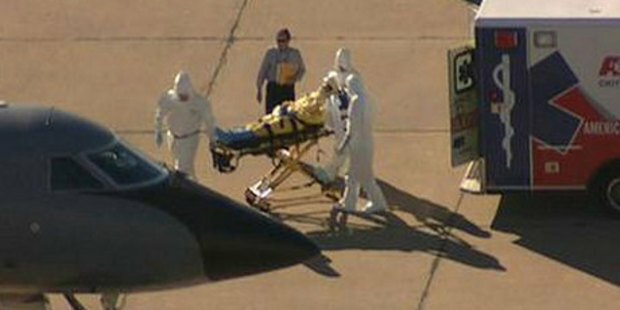 Ebola in the US: Who is clipboard man and why isn’t he wearing a Hazmat suit? More on stupid theories and fools who make the left look desperate – this time involving Abbott, cars and residences. Let’s get something sorted first – the cars used by our PM and others are ageing and no longer meet international standards for VIP cars. Prime ministers do not suddenly say ‘I want new cars’. A government department is responsible for purchase and maintenance of cars and if they decide a fleet is getting old and needs replacing then that’s what will happen. Julia Gillard realised that purchasing new vehicles just before an election was not going to be a good idea and postponed the purchase. Nevertheless the tender process was begun. Had Labor won last years election the car purchase would have gone ahead, as it has under Abbott. Some things have to be done as part of normal up-grading and maintenance. The renovations to The Lodge are another example, work that had to be done before the building collapsed into rubble. Abbott did not order the work and he is not having The Lodge rebuilt to his taste. Ditto for Kirribilli House – whatever money has been spent this year has been for normal maintenance and grounds work, with one exception. That expensive rug chosen for the family room. It seems a designer chose it, not Margie herself and not Tony. Which brings us to the stupid conspiracy theories. Please excuse the lack of links to back all this up – they would fill a page. First theory- Abbott decided BMWs would be better for the new government fleet rather than Holdens, allegedly because his daughter had a job with BMW. That one won’t fly. Bridget Abbott worked as a racing ambassador for a few days at a Sydney racing carnival a few years ago, when Abbott was LOTO. The event happened to be sponsored by BMW but Miss Abbott’s job was organised by the AJC and Peta Credlin, not BMW, who had nothing to do with it. The BMWs were chosen because it was a cheaper deal. Second – the Twitter furore about Abbott allegedly spending over $6 million on cars for the G20. It’s rubbish. The government is spending $2 million to leased extra cars for that event, plus about $4 million on the new fleet cars which, if ready, will also be used at the G20. These things keep coming up, although it’s very easy to find the truth about the issues. Almost every day someone will tweet stale old allegations. It makes us lefties look like dills and I wish it would stop. It seems pointless to me to discuss someone’s choice of men. It’s a personal thing. Looking back at Bruce Wilson, I could see some qualities in him, and also in Tim. They both seem to show loyalty towards her. Craig Emerson was once her partner. I have nothing but admiration for him. She also made a good choice in choosing her colleagues, Windsor and Oakeshott. There were problems with Slipper and Thomson but they served a good purpose, that of keeping the Labor govt going. I should have phrased that better – Julia Gillard’s appalling support for all the wrong men – men in politics that is. It’s likely her support for Slipper, Rudd, Latham and others, support that was never returned when she herself needed it, came from a desire to see the best in people and to overlook their faults. I don’t think Wilson was the ideal boyfriend, he was married and shifty, but as the lady has said, she was young and naive. We have all made mistakes in that line, I would think, for the same reason. But later, in her personal life, she chose well. Who wouldn’t fall for Craig Emerson? And she seems to have struck gold with Tim. If Abbott has not renounced his UK citizenship he was ineligible to be elected as member for Warringah in 2013, and is not that member now. It may be of particular importance in the context of losing votes (by tie) in the Gillard government. Or it may not be. But if he hasn’t renounced his citizenship he’s not eligible to be the Prime Minister. SHANGHAI (Reuters) – A Chinese drugmaker with military ties has sent an experimental Ebola drug to Africa for use by Chinese aid workers and is planning clinical trials there to combat the disease, executives at the firm told Reuters on Thursday. Has anyone asked Abbott the simple question: when did you renounce your British citizenship and will you provide us the evidence? The Russians have one ready to roll out as do the Americans. Hmm I wonder if having vaccines so quickly indicates a bit of germ warfare research using ebola had been going on ? Oh well, when Latika told us breathlessly that Julie Bishop was warming up the Death Stare for Vladdy I though maybe it’ll get hot, shirt-front-wize, but no luck, it seems. And let’s not forget Mr Putin likes Bare Wrestling… or did I read that wrong? Instead Our Jules confined her bodice-ripping to the Russkie Foreign Minister. Milan: Australian Foreign Minister Julie Bishop appears to have missed an opportunity to “shirt-front” Vladimir Putin over Russia’s role in the MH17 tragedy. There had been speculation that Ms Bishop could confront Mr Putin at a meeting in Italy on Thursday, in a preview of his encounter with Prime Minister Tony Abbott at the G20 meeting next month in Brisbane. Video evidence suggests Ms Bishop and Mr Putin were in the same room on Thursday night – but an Australian diplomatic source said she “never saw him”. Probably a good idea, seeing as you never know when you’ll need Presidents and the like to be your new Best Friends. Now all we have to look forward to is the whirling Dervish landing a haymaker on the Karate Kid’s mush (no coward punches from our Tony), or maybe chucking a Wobbly with his chin all jutted out and the spit flecking off the end of his thin, cruel lips &etc. Perhaps there’ll be more important things to discuss at the G20 – like global financial meltdowns in-the-making, Climate Change, or Existential Pestilences and the like – rather than what our Schoolboy Prime Minister sees as impressing the Ray Hadleys of this world. Re his citizenship; the MSM have been silent, so I presume he has renounced, as he said. But it was alleged Credlin was brought into the FOI request, and prevented disclosure. IF true, that should be big news. I would have thought it would be UK authorities who should be approached re his renunciation. In fact I would think that wherever UK passports are issued, they would have access to a database for renounced citizens. Just a thought – maybe the sensitivity does not relate to his actual renunciation, but possibly corners were cut re his police check, given he had been charged with sexual assault, and no conviction recorded in relation to damaging street sign. It was a VERY late registration of birth – he was an adult – so the rush was probably to be eligible for the Rhodes scholarship. IMO it should be resolved. It is not a conspiracy akin to the birthed question. Also I presume he had voted in elections prior to that, and declared himself as a UK citizen. Someone should check old electoral rolls. J’adore really really good photography. Does that make you a dorable?